The city of Chillicothe has entered into an agreement with Livingston County to work cooperatively in repairing roads of mutual interest. City council members unanimously passed an ordinance authorizing the agreement during their regular meeting Monday evening, April 9, 2018, at City Hall. The proposal had already received county approval. According to the agreement, the county will provide $50,000 per year for road improvements. The county funds will come from revenue that is generated through the tax increase that was passed last year. In promoting the tax increase ballot issue, the county advised voters that the county would spend $50,000 per year from the new tax to improve roads. The agreement applies to all roads of mutual interest which includes, but is not limited to, roads that are now located partially within the city and partially within the county and roads that connect to major arterially streets, roads and highways. Litton Road, which runs along the east side of Green Hills Golf Course south to Danner Park is riddled with potholes and is one such road considered for improvements. "It's a road that the county and city have looked at closely and have agreed it needs work," said City Administrator Darin Chappell. "It's partially in the city, but not entirely in the city. I'm not sure what we can do this year, but we will look at it and determine a plan of action." The administrator said that if it ends up being a project that would require the surface being stripped down, costs could exceed available funds and repairs may need to wait; however, it's possible that the road's potholes could be filled and the road get an overlay to smooth the surface. City and county officials will mutually agree upon the selection of roads to be improved with the funds, the agreement states. Chillicothe will match at least dollar for dollar the county's funds used to improve a road. The expenditures by Chillicothe will include both costs for engineering, right-of-way acquisition, legal expenses and other soft costs, and construction. Chillicothe will be responsible for the engineering and design of roads to be improved with the funds, the agreement states. The agreement is to be in effect for 10 years. 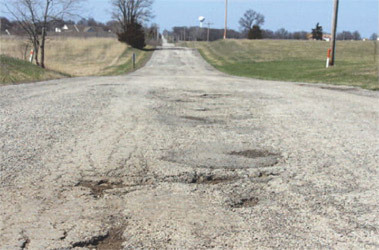 CAPTION: Litton Road, which runs along the east side of Green Hills Golf Course south to Danner Park, is riddled with potholes and deterioration and may be considered for improvements through a mutual agreement between the city of Chillicothe and Livingston County. An agreement approved by both parties calls for the county to provide $50,000 annually to improve roads of mutual interest with the city. The city would at least match the county's funds - dollar for dollar - on whatever road project is selected for improvements.